The long-term partnership at Damaraland Camp between Wilderness Safaris (private sector; WS) and the Torra Conservancy (community) in Namibia illustrates that tangible benefits from such joint venture partnerships play an important role in development and poverty reduction, with intangible benefits improving social welfare, biodiversity conservation and local economic development. rural poverty, biodiversity conservation issues, human-wildlife conflict As a result of few alternative livelihoods and harsh climatic conditions there is a high level of poverty in the Damaraland area. This resulted in subsistence hunting of wildlife, as well as the killing of wildlife as a result of human-wildlife conflict and land use pressures. These challenges resulted in little support for biodiversity conservation and tourism in the area. local communities (Torra Conservancy) and tourism concessionaire (Wilderness Safaris). Joint venture partnerships can, over time, assist with reducing poverty and improving livelihoods, as well as promoting conservation provided that there are equitable benefit-sharing processes in place and expectations are constantly monitored. Creating employment and using local suppliers assist with reducing poverty in the area and, therefore, work towards creating value from tourism and conservation for local stakeholders so that they engage in biodiversity conservation going forward. Understanding and measuring impacts on local communities living in and around protected areas is, therefore, important in terms of assessing tourism’s role and impact in these areas; ensuring that there is an association between benefits received and the associated tourism/conservation is critical to long-term sustainability as is a willingness to adapt and to use proven examples in other areas. A total, for community levies only, of over NAD 3.3 million (approx. USD 235 000) has been paid by Damaraland Camp to the Torra Conservancy between 1st March 2011 and 29th February 2016. In terms of employment, Damaraland Camp employs 30 individuals, 77% from the Torra Conservancy. The building of the Camp required 20–30 unskilled, casual labourers, some of which went on to find permanent employment in the Camp and in other WS camps in Namibia. Damaraland Camp guests visit nearby villages and the Camp makes use of laundry services, wood purchases, and road maintenance from local community members, further injecting an amount of NAD 123 816 (approx. USD 9524) into the local economy from 2011 to 2015. Staff costs, in terms of wages, meals, housing, uniform and training totalled more than NAD 8.89 million (USD 635 000) over the six year period (March 2011-Feb 2016). Extensive positive biodiversity impacts have also resulted from the partnership, including the recovery of a number of species, including Hartman’s mountain zebra, elephants and black rhino. From year ten to fifteen of the partnership, the Torra Conservancy was given, per annum, 20% equity in Damaraland Camp until they owned 100% and chose to sell a portion back to Wilderness Safaris to form a joint venture equity partnership. Wilderness Safaris was then offered and purchased 60% of the Camp back from the Torra Conservancy and they are now operating as equity partners with the JV leasing the land from the conservancy for a fee. Bennie Roman, Torra Conservancy Chairman and Damaraland Camp Board of Director until 2014, says: “From the start we kept our relationship as good as possible. We have quarterly Joint Management committee meetings where we discuss matters on the ground and, present the conservancy and Camps reports and plan for the future. Conservation is our joint interest and tourism their (Wilderness) culture. We have learnt from each other over the years and we can now apply our knowledge.” The lodge has also been upgraded, with both WS and the conservancy investing capital for the upgrade. These upgrades were initially fully funded by WS but the conservancy used cash earned from the sale of a portion of the Camp back to WS to settle their portion of the shareholders contribution in terms of the upgrade. The reinvestment of ‘community capital’ into the project is one of the first instances in Namibia that did not involve donor funding or loans. 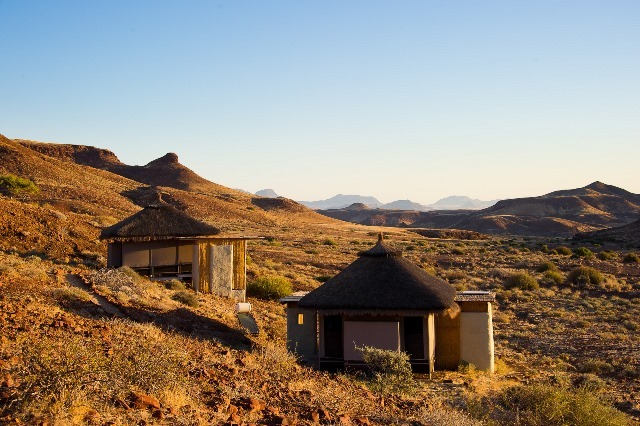 In 2009, Wilderness Safaris and the Torra Conservancy entered into a formal equity JV and registered the company Damaraland Camp (Pty) Ltd. Roman: “The business became sustainable over the years and we decided to enter as a business partner. We now have 40% share in the business and still receive our monthly 10% turnover as bed levies. We feel we have ownership and can make decisions at director level.” In 2010, WS assisted the Conservancy to raise a bank loan of NAD 500 000. This money was used to build the Damaraland Adventurer Camp and is the first instance of a community raising their own funds for building purposes and helped to empower the community and provide experience in financial management and business skills. “Where there are issues or areas of concern in the partnership we discuss the topics and set joint tasks to solve any problems. Wilderness concerns are mostly over predator killings, especially Lions because it affects their market negatively but they also understand that we must keep a balance to sustain communal farming in the area.”, says Roman.